Fortnite Season 8, Week 4 has dropped and with it comes a challenge almost identical to its Week 2 variant. Rather than being asked to inflict 100 damage to opponents with a Pirate Cannon, you’re required to fire yourself through structures. Like Week 2, finding the cannon’s is still a large part of the challenge and just like Week 2, the actual destruction part appears to be as finicky. 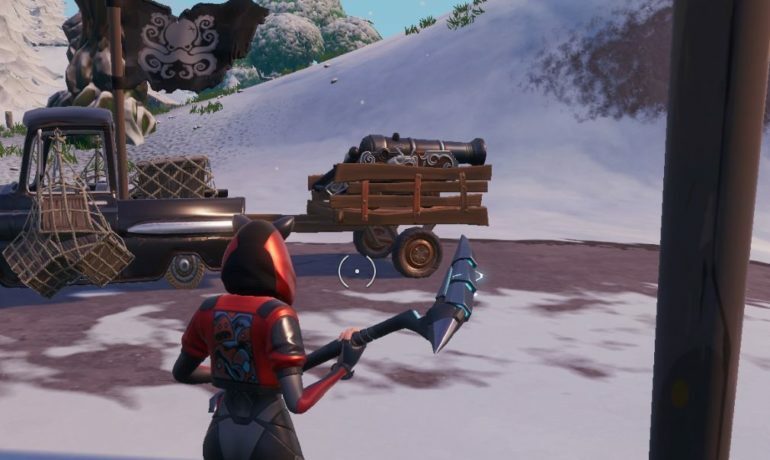 For those that are just jumping into the Season 8 or aren’t particularly fond of the Pirate Cannons and are only getting around to them because of the challenges, we’ll explain how they work. The first thing you should note about these the Pirate Cannon is that it is actually a ‘vehicle’ (e.g. The Baller, Driftboard, ATV, etc. ).You actually ride them like the old ‘shopping trolleys’ from a few seasons ago, but with a cannon affixed to the front. This mobility makes this challenge significantly easier as they’re not exclusively defensive weapons, waiting in ambush for some rube to wander by. This means you can reposition and move the cannon to a structure, making it significantly less painful. Following this, you also have two options in how you actually fire the cannon. The first is you can use the cannon from behind, which lets you drive and light the cannon’s fuse, which will then fire a cannonball. This cannonball moves agonisingly slow and has a parabolic trajectory, making it difficult to aim in conjunction with its slow size. These cannonballs are really not meant to be killing players, they’re meant for sieging and destroying structures, which they do well, but doesn’t count towards this specific challenge. The second firing option is to interact with the cannon from the front and you’ll jump in, gaining the ability to fire yourself. While in flight, you basically are a cannonball (without the exploding part). You’ll barrel through structures (taking some damage) and will significantly hurt any player you collide with. This is the option you need to use to complete the challenge, as firing yourself into structures is key to getting credit. Now what in particulac Epic mean by ‘launch yourself through structures’: Structures seems to mean, ‘buildings’ in this context. Random walls or ramps don’t seem to count, it appears to require a ‘structure’ of a certain size for it to count. As for 25 structures, you don’t need to shoot yourself through 25 actual structures, you just need to meet the threshold for a structure and then each wall/roof/ramp you destroy seems to count individually. The good news is, it doesn’t need to be an enemy structure, just a structure, including pre-built map assets, which simplifies this immensely. So now it becomes a game of finding a Pirate Cannon close enough to a location with a decent amount of pre-built structures. As you can see, the pirate camps are the most common spawn locations for the cannons and are typically the most trafficked area in which you will find a cannon. As we’ve covered each pirate camp individually in another article, we’ll only show specific screenshots of the non pirate camp cannons. This is probably the first place anybody would think of when looking for a battery of pirate cannons. There is a pirate ship docked at Lazy Lagoon, you’ll find cannons under the deck. F3 on the main map’s grid. Lazy Lagoon has a real ‘pirate town’ vibe going on. Part of that is created by a copious amount of cannons laying around, especially near the dock. You’ll find these cannons in both F3 and F4 on the main map’s grid, not far from the ship. While this week’s version of the challenge isn’t nearly as annoying as Week 2’s, this can still be quite annoying as Epic’s definition of a structure seems to be arbitrary and more based on how many walls/roofs/ramps you can destroy in a single shot. Personally, I wheeled the cannon from the tundra pirate camp near Shifty Shafts all the way to Tilted Towers. By the time I got there most people moved on and I had a veritable smorgasbord of structures to destroy at my leisure. Regardless, any location with decently sized buildings (i.e. bigger than a 1×1) should suffice if you can get the cannon there. The pirate camps that spawn the cannons don’t seem to count, but that might be because I seem to get stopped short compared to other buildings; you may have more luck than I did with them. Week 4 introduces two challenges for newer gameplay ‘items/vehicles’ as well. One asks you to use The Baller five times, for which we documented all their spawn locations. The other mashes the old treasure hunt style challenge with the new ‘Buried Treasure’ item, for some on the spot adventurin’. All in all, a pretty solid week of challenges that require a lot of searching and travelling. Happy plunderin’.